Once a Portuguese colony, Mozambique achieved independence in 1975. Nampula, Quelimane, tete, Nacala, Pemba. Ethnic groups: african 99,7% (Makhuwa, Tsonga, Makonde, Lomwe, Shangaan, Shona, Sena, Ndau, Europeans, Euro-Africans and South asians. Mozambique is on the Indian Ocean coast of Southern Africa, bordered by South Africa to the south, Tanzania to the north and has inland borders with Malawi, Zambia, Zimbabwe and Swaziland. Mozambique possesses a very long eastern coastline along the Indian Ocean, a fantastic drawcard for scuba divers, fishermen, sailors and beach lovers. Maputo is the capital city of Mozambique. It is the largest city of Mozambique also with the country�s most important harbour. It is situated at the mouth of the Santo River in the extreme south 90 km from the border to South Africa. Compared to some other sub-Saharan African cities the urban area feels small and concentrated with wide avenues and old trees. People are generally out and about in the streets, walking driving and getting on with life. The vibe is healthy and active, with little begging and lots of street vendors and markets. There is no heavy presence of police during the day, and no feeling that it is needed. - The Railway Station on Praca dos Trabalhadores was designed by Gustave Eiffel (after his fall from grace in the Panama canal scandal), and bears the mark of his genius. - The National Art Museum has a small but good collection of Mozambican art, including several large canvases by the world-renowned Malangatana. - The Jardim Tunduru is a very pretty (albeit small) botanical garden. - The Museum of the Revolution chronicles Mozambique�s fight for indepedence from Portuguese colonialism. - The Mercado Central in the Baixa district has fresh fish, crabs, calamari, fruits and vegetables, and many household staples. Safe, lively and recommended, especially if cooking for yourself. - Walk up Avenida Julius Nyerere. Start from the Hotel Cardoso or Natural History Museum along R Mutemba to Nyerere then left (north) to the Polana Hotel. Boutiques, restaurants, curio vendors, video stores, etc. to be seen in the relatively upscale Polana neighborhood. - Visit some beautiful beaches, such as Catembe and Ponta d�Ouro. Ponta d�Ouro is a popular destination for South African divers and surfers. There is a small village, but it is mostly overshadowed by the tourist camps. It is very jovial in these atmospheres and it is not dangerous in the least bit. Inhambane is a sleepy historic town some 485 km north of Maputo. It has some great colonial architecture (in a low-key sort of a way) and is considered by many to be one of the prettiest towns in Mozambique. It is situated on a peninsula overlooking a bay, and also serves as a springboard to the coastal resorts around Tofo beach (some 30 km due east, along a reasonably good road). Tofo Beach has been described as �the next Goa�, and while this may be pushing it a bit, Tofo has definitely become a traveller�s mecca on the Eastern coast of Africa. The reasons are not hard to discern: beautiful stretches of beach, a friendly laid-back vibe, a small but pumping nightlife, great diving and snorkeling and a few good restaurants too. Tofo and surrounds have some truly excellent diving, with nice reefs and excellent large marine life. Whale sharks and Humpback whales in season, reef sharks and much more. Don�t miss Manta Reef, home of three cleaning stations where the critters really throng. Most of the better dive sites are at around 25-30 meters, requiring deep-dive certification (which you can get through one of the dive shops if you don�t have already). Snorkeling is a MUST� swimming with whalesharks, the largest fish in the world is incredibly special. Although their mouths are over a meter wide and their bodies 8m long they are harmless. if you�re lucky you may also get to swim with wild dolphins, manta rays. Swimming with whales is prohibited, although you�ll be happy to see them from the boat. Inquire with the dive shops about trips. Surfing is also a nice possibility in the warm Indian Ocean and boards can be hired from the little cafe next to Diversity Scuba. Vilanculos is a popular beach town and the gateway to theBazaruto Archipelago, a group of five idylic islands off the coast of Mozambique the largest of which is Bazaruto Island. Others are Inhaca and Paridise Island. The Archipelago is truly one of the most beautiful destinations on the African continent. The area is now protected as a conservation area and national park. The park is one of the largest in the Indian Ocean and a crucial achievement in global marine conservation. Sand dunes are found throughout the Archipelago and tidal flats and inland saline lakes support a wide variety of seabird species. Coral reefs are also home to thousands of fish and coral species and marine mammal species. The largest dugong population along the eastern African coast can also be found here. Mile after mile of deserted sandy beaches also grace the island. The leeward side of the island chain is surrounded by calm turquoise waters while the windward side offers an even more isolated and untamed seashore with waves constantly pounding the coastline. While offering an exquisite paradise, travelers may find accommodations on the islands prohibitively expensive particularly with the closure of the one of the last reasonably priced accommodation Gabrielle� to make way for yet another luxury lodge. Fortunately, Vilanculos offers a plethora of affordable places to sleep. Daytrips by dhows can easily be arranged from the mainland. A untouched paradise on earth, the archipelago has earned its reputation as the �Pearl of the Indian Ocean�. Ilha de Mozambique is a city in Nampula Province with a historical heritage that�s unmatched in the rest of Mozambique, and indeed the rest of Africa. It was the capital of Mozambique for nearly four centuries before the move to Lourenco Marques (now Maputo), and had been used as a major base for the arab traders long before the arrival of the portuguese. Everywhere. Ilha�s a magical mix of old portuguese and old muslim architecture. It basically divides into two halves - the old stone town in the north and the �reed town� in the south. However the reed town here is set down from the main streets. The museum is in the old Palacio Govierno, a big red building up in stone town. In the same building is a tourist information office that sells really good street maps and has all sorts of other information about the various restaurants and pensaos on the island. It�s well worth heading here as soon as you arrive. Also well worth a visit is the fort at the northern tip of the island, which contains the Church of Nossa Senhora Baluarte, almost certainly the oldest surviving European building in the southern hemisphere, dating back to 1522. There�s a dive centre at the northern end of the island just down from the fort. You can take boat trips, visit the museums, or just laze on the beach. 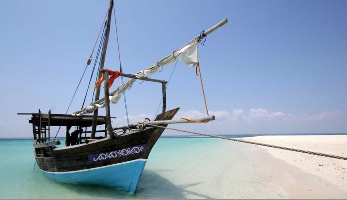 If you�re feeling adventurous take a dhow over to the mainland at Chaga or Mossuril and explore along the coast there. Nampula is the capital of Nampula Province in northern Mozambique, surrounded by plains and rocky outcrops. The city is connected by plane (LAM) to Maputo; it hosts the regional market and is well supplied with shops, banks, hotels and restaurants.Nampula is the staging post for journeys further north (towards the Tanzania border) or west (towards Malawi). The only passenger railway service in the Country connects the town with Cuamba near the Malawi border.Attractions in Nampula include the large, domed cathedral and the ethnology museum. Pemba is a port town in Mozambique located on the south side of the world�s third largest natural bay. It is the most important centre in northern Mozambique, and therefore has banks, patisseries, supermarkets and restaurants, although the town is very run down with paved streets having massive potholes and other storm water damage. The town was built over rolling hills, and most people live in wooden huts set amongst many thick baobab trees. The town is renowned for its Portuguese colonial architecture. It was renamed Pemba at the end of Portuguese rule, in 1975. Pemba is also renowned as being a prime destination for water sport and diving enthusiasts as a coral reef lies close to the shore. Pemba has increasingly become a tourist destination, particularly for upper-middle class Mozambicans and South Africans. There is now a weekly flight from Johannesburg to Pemba, a five-star hotel, the Pemba Beach Hotel, restaurants, and other forms of entertainment. Ibo Island Lodge is the only Mozambique Island Resort to offer fully supported dhow and sea kayak safaris in the Quirimba�s Archipelago. There are 32 islands to explore � fantastic diving and snorkelling in one of the last remote parts of the African coastline. Our standard recommended minimum itinerary includes 4 nights island hopping by dhow or kayak and 3 nights at Ibo Island Lodge � but you are free to tailor make your perfect adventure! Perfect for groups of friends and family. So choose between a Tailor Made Safari or join groups of like minded travellers on a Scheduled Departure. Sail off on a unique Mozambique Holiday under the expert eye of a professional guide and local crew. Snorkel off deserted white sandbanks into clear blue seas then camp overnight on secluded Quirimba�s island and beaches eating fresh seafood on the fire. Ibo Island Lodge knows the northern Mozambique region intimately so come aboard and enjoy un-equalled natural and cultural journeys of discovery. Create your own itinerary to suit your specific needs. 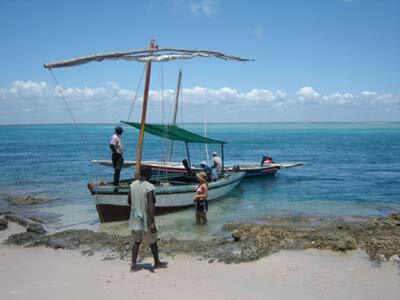 Many independent travellers use one of our dhow safaris as part of a romantic Mozambique honeymoon package. 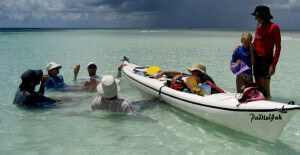 Ibo Island Lodge also offers incredible Sea Kayak Safaris throughout the Quirimbas Archipelago. Combine sea kayaking with sailing and island hopping aboard your support vessel � a traditional dhow equipped to support the paddlers and your group. Depending on your level of fitness and experience paddling distances can vary and time can be spent paddling off the support vessel if weather conditions require this. Longer expedition style paddling trips are especially popular with groups and can be arranged on request. We can cater for up to 20 paddlers at one time. This is adventure travel at its best!